The small paint booth is an amazing piece of equipment to paint small sized components. They have become high in demand recently because of many useful reasons including portability. They are reasonably priced and are one of Spray Tech / Junair’s most popular pieces of equipment. They are smaller in size than our regular open face paint booths, used for small size item painting, high performance, portable and extremely energy efficient. Table tops are self-contained and they do not take up much space and can fit almost anywhere. The beauty of these self-contained small size paint booths is that they are simply plugged and play. (Available with factory assembly option) All you have to do is to plug it into the power socket and you are all set to paint. 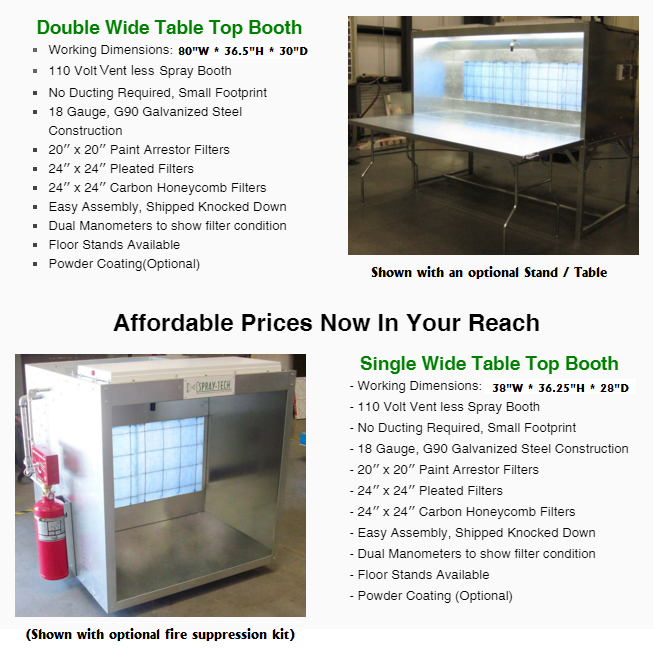 You will not require any kind of ducting for these mini paint booths. There is a three-stage filtration system included on the table top, which uses carbon as the final stage for solvent vapor removal. Our small paint booth comes in two convenient sizes. Small size open face table top paint spray booths can be used in body shops, industrial paint shops, wood/furniture paint shops, plastic equipment facilities and in all those places where medium sized items are painted. Previous story Paint Booth Control Panel Monitored By Gadgets!